Welcome From Rev. Dr. Kenji Akahoshi From Board President LuAnn Lee To Buddhism To Our Path To Shin Buddhism To Visitors News/Kaiho Newsletter (Kaiho) Archive Latest News News by Category Groups BTSD Groups Adult Buddhist Association (ABA) Buddhist Women's Association (BWA) Dana Group Dharma School EcoSangha Jr. Young Buddhist Association (Jr. YBA) Taiko (Drum Troupe) 2019 Planning Calendar Connect Contact/Hours Maps/Directions Useful Forms and Flyers Volunteer/Involvement Subscribe Spiritual Life ¡ Donate ! We’ll share new date soon…. 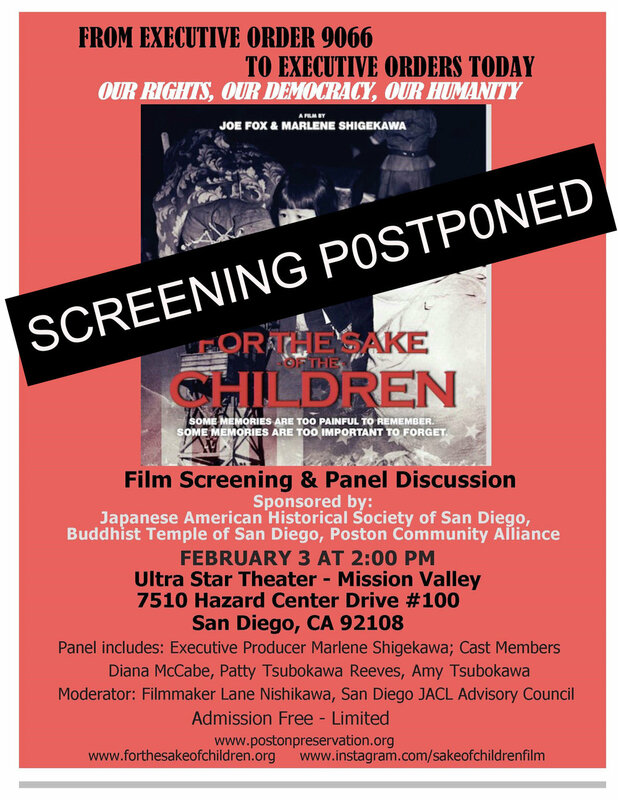 “For the Sake of the Children,” a new film by Joe Fox and Marlene Shigekawa, was originally scheduled for February 3 but will be rescheduled by the producers at a later date to make sure all interested parties will be able to attend. The documentary focuses on mothers and children in the camps. Producer Shigekawa was herself born in Poston. For its San Diego premiere, the film is cosponsored by the Japanese American Society, the Buddhist Temple of San Diego, and the Poston Community Alliance. The new date and any change of venue will be announced shortly. The Temple and other sponsors will spread the word as soon as information is announced. Get Your February Newsletter Here! Time for Bingo All Year Long! Copyright © 2019 by the Buddhist Temple of San Diego. All rights reserved.